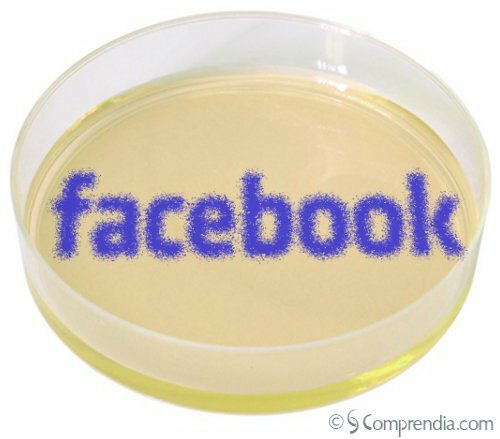 Life Science Facebook Engagement: Which Companies Are Creating ‘Contagious’ Pages? Recently Facebook announced a new metric, ‘people talking about,’ would be available on the left sidebar of pages below the number of likes. The number shows how many people have interacted with the page by liking it, commenting, or sharing, and it is meant to show how active a page is. We used this number to do an analysis of around 45 life science companies on Facebook, helping us to understand which companies are successfully engaging life scientists, and why they are successful. Two charts are needed to fully understand the data, and you can also look at the raw data in the Google document. 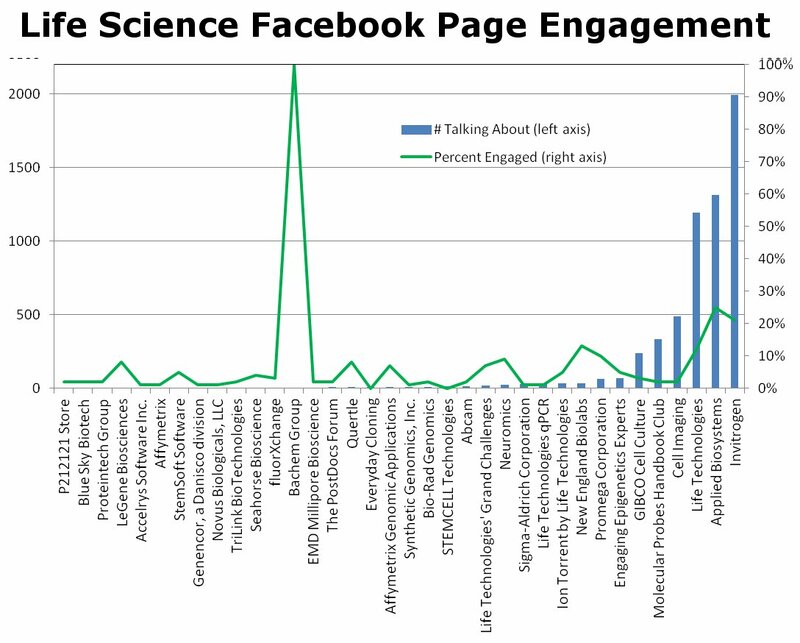 The first chart shows the number of ‘people talking about’ for each page, along with the percent engagement, or this number divided by the total number of ‘likes’ for a page. You can see that Life Technologies holds all five top spots for ‘people talking about’: Invitrogen, Applied BioSystems, Life Technologies, Molecular Probes Handbook Club, and GIBCO Cell Culture. We applaud them for their efforts, and have been tracking their activity, which helps us to understand what the numbers mean. The Invitrogen and Applied BioSystems pages were launched about six months ago, and we noticed growth was slow for months. Recently both pages have shot up in the # of likes, and we are fairly sure this growth is due to advertising. So, since the ‘people talking about’ number includes how many people have liked the pages, these numbers are high for the pages now, and will likely only be sustained with advertising. We have found that Facebook ‘likes’ can be obtained for about $1 each (contact us to learn more), so by much hand waving you can surmise that LIFE is putting a healthy budget into Facebook advertising, perhaps $10-20K per month. The numbers in the first chart also speak to great content which the top companies are providing. Engagement will surely go down after the $ is spent if the content does not continue to engage. 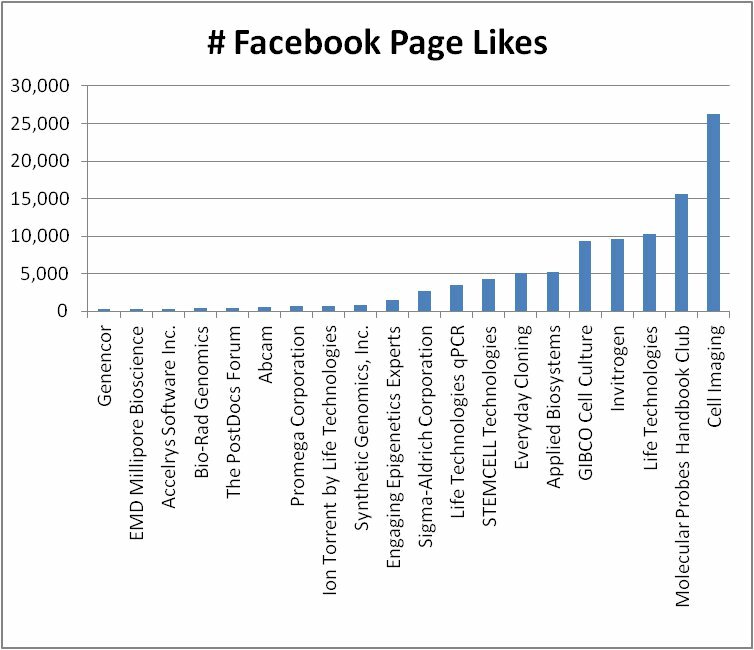 The chart above is probably biased by the influx of advertising dollars, so we also charted the total number of life science page ‘likes’ below. LIFE has pages that have grown greatly due to the content, the Cell Imaging and Molecular Probes Handbook Pages are excellent examples. This content must be not simply a broadcast of a company’s products, something we’ve discussed before regarding life science companies on Twitter. How do the companies find the content? We’ve found custom RSS feeds, which pull information about a topic from all over the internet, including news, blogs, and Twitter, to be vital for this tactic, and we can set one up for you. Great article Mary! That 10-20k number is much too high though. :) We’ve integrated social media in many parts of our business and have really gotten the whole organization to buy-in. As a result we enjoy a diverse promotional approach. We want to get better for the researchers we serve and this helps us do exactly that! Agreed, very nice piece. As for content on the Cell Imaging page, I can add that while regular search postings and links from RSS feeds draw interest, the content that draws the most engagement is, far and away, our own primary research and development data, along with fluorescence micrographs submitted posted by fans and users of the forum. Its a great way to share pretty pictures! I find useful links on the page almost weekly, but as an admin (and fan) of the page, we work hard to keep fresh content straight from the bench as a central theme. As research scientists, we greatly appreciate the visibility and discussion of our imaging data, as well as that posted by friends and fans. Thanks for the notice! Hi Mary, excellent job at profiling the opportunity and the early players. The data you presented so well sends a clear message that will be a wake up call for all companies in the Life Science industry (those listening :) ). At Jon and Dan, great points to start the debate on what is relevant engaging content for users, And yes, I do agree with Dan that content from the bench is (one) right way to go (btw, great job with the multitouch microscope. Is it the one that is up for an award at CONNECT?). Sorry to throw off your first chart!